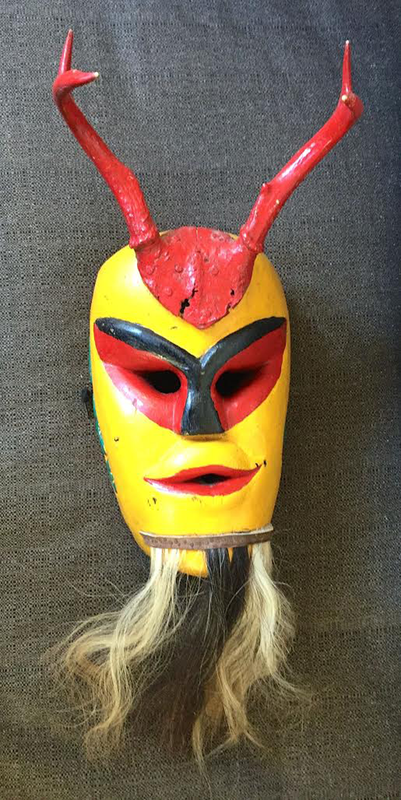 John Levin, a Mexican mask collector who lives in San Francisco, California, has sent photos of some of his masks that are from San Luis Potosí (SLP). I am pleased to share these with you. In his day job John is a screenwriter; he has just published a book of his plays, Three Plays By John F. Levin. If others would like to contribute photos for display on this site, I would be pleased to explore that with them. The first of these masks is an obvious devil, one of the Fariseos that perform during the drama of Semana Santa. Several aspects of this mask are notable. First, the features of the face are carefully carved, and enhanced by careful painting; I perceive the mask as having a glamorous feminine face. So I wonder if this is a Diablita, a female devil. Of course the beard argues against this, but that may have been applied by a dancer as an afterthought. Certainly there is a sharp contrast between this face and the faces of the brawlers in a recent post. 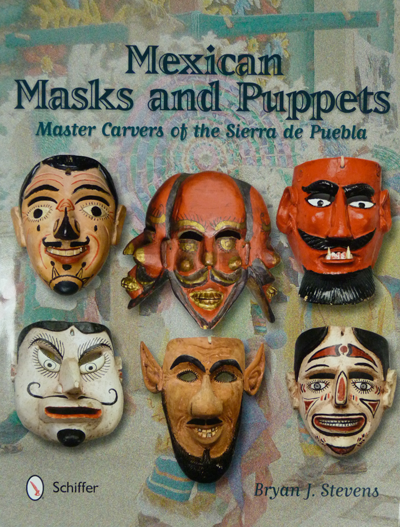 This is another post in a series about Fariseo and related masks from the Mexican state of San Luis Potosí (SLP). This week I will present masks with animal faces. 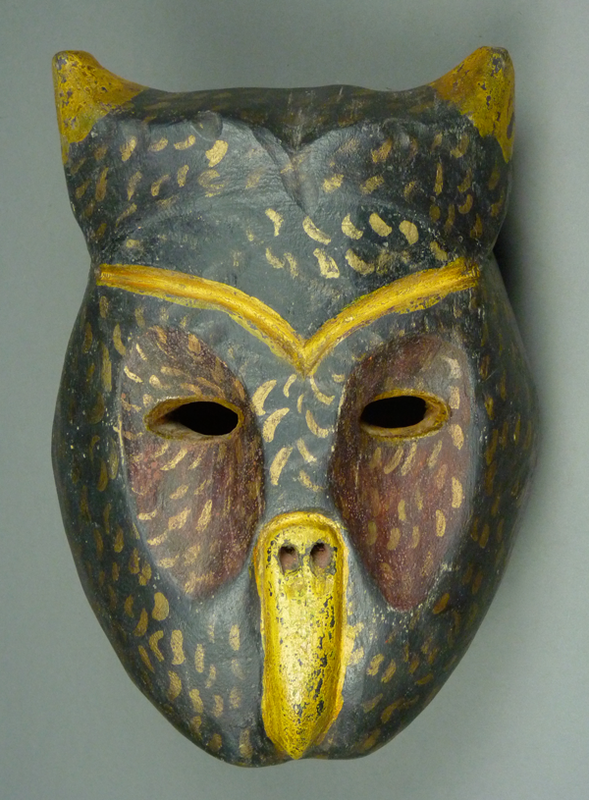 In 1993 I purchased this owl mask from the shop of Mary Jane Gagnier de Mendoza—Mano Magica— in Ciudad Oaxaca, although it was originally collected by Jaled Muyaes and Estela Ogazón. According to the tag, this is a Fariseo mask from Tanlajas, SLP, that was danced during Semana Santa. The Owl mask is particularly interesting because it has drilled holes in a rectangular arrangement on the top; these evidently held 18 feathers. This week I will continue to present Fariseo masks from San Luis Potosí (SLP). Today we will examine five human faced masks; two appear to portray drunks/barroom brawlers, another is very similar to the first two, although he lacks their wounds and is otherwise stigmatized by unattractive physical features. The fourth mask depicts a Soldado (soldier), which reminds me of the Fariseos from other states with names like Roveno (Roman soldier) and Centurion (see my post of March 9, 2015). The fifth is a Loco, someone who engages in wild and unpredictable behavior. As I noted in the last post, such masks are based on stereotypes of otherness, targeting those who are in some way different. This week’s masks appear to exemplify individuals notable for their impulsive or aggressive tendencies. I believe that all five of these masks were primarily worn by Fariseos during Semana Santa (Holy Week). Here is the first of these Fariseo masks. René Bustamante called this the mask of a Golpeado (a person who has been wounded or beaten up); he believed that it was intended for use in Carnaval. I have no doubt that it would serve well in that fiesta. As I discovered in the Sierra de Puebla, there are masks that were specifically created for Carnaval (such as the Onion Woman described in November 17, 2014 post), yet most of the masks used during those revels were borrowed from some other dance. This one was collected in Tancanhuitz, SLP, and René thought it was from the 1940s. If one googles™ “golpeado,” one is shown many photos of wounded faces. Some are of actors in makeup while others are victims of assault. In the last two posts we have examined Fariseo masks from San Luis Potosí, such as skulls, demons, and devils, that were obvious representations of negative figures. But I threw in a bishop (Obispo), to include a potentially positive figure who had evidently turned bad. 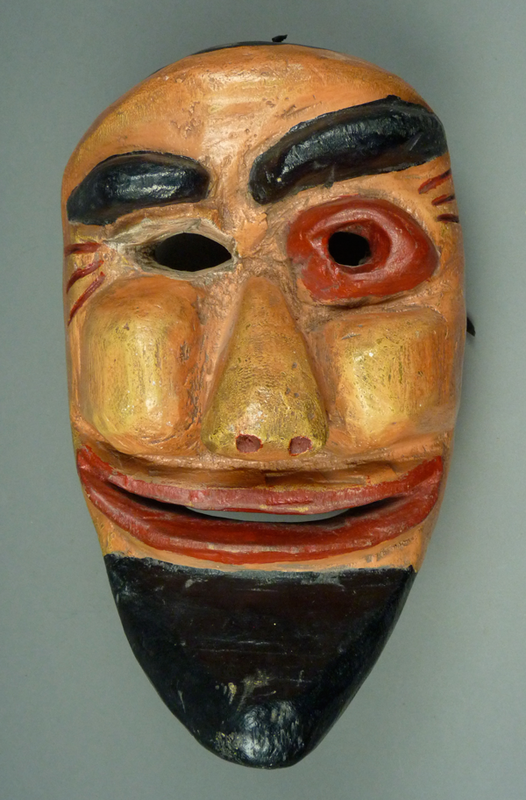 As Janet Esser pointed out in her doctoral thesis, Winter Ceremonial Masks of the Tarascan Sierra, Michoacan, Mexico, there is an obvious theme in Mexican Indian dance dramas of good versus bad or beautiful versus ugly. One can also find this expressed in terms of insider versus outsider, normal versus deviant, or wise versus ignorant. Dances featuring such dichotomies appear to have the purpose of moral teaching, essentially illustrating culturally defined behavioral choices, but sometimes through the use of stereotypes that have nothing to do with choice, because they reflect ethnicity, nationality, victimization, mental illness or intellectual limitations. Stereotyping through such labels is becoming increasingly less acceptable in North America, although it was common in the past, when such images had been incorporated in this dance. Today’s post will feature masks that raise such issues, while those in next week’s post will present another group of masks with ambiguous meanings that are likely to have been associated with ignorance and associated impulsive behaviors. This is an arbitrary division on my part, to manage such a variety of masks that must all be ultimately meant to represent negative figures, in this dance context (portraying the enemies of Christ during Semana Santa). 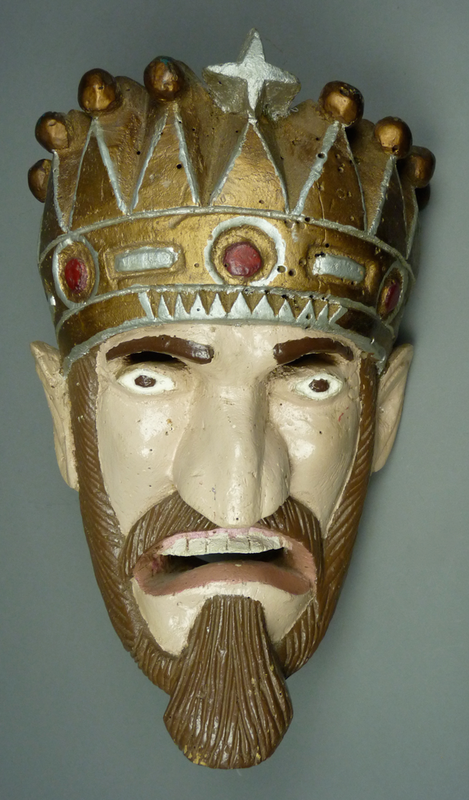 Here is a mask of a Rey (king). His expression is unfriendly, as if he is a malevolent figure—an evil king. On the other hand, he is wonderfully carved. There is a cross or star on his crown.